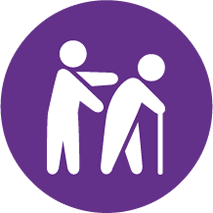 Fairhand Visiting Physiotherapists is a team of mobile physios, working within the Croydon and Surrey area to provide treatment to elderly patients in the comforts of their own domestic household or nursing home. We work towards helping older people restore mobility and balance through combining our medical expertise with practical treatment methods whilst safely working in your home to provide for your day-to-day scenarios. Patients and their families concerned about a history of falls or hoping to prevent that crisis situation often seek our help as we understand the underlying circumstances which contribute to the risk of falling; conditions such as dementia, Parkinson’s disease or a stroke.